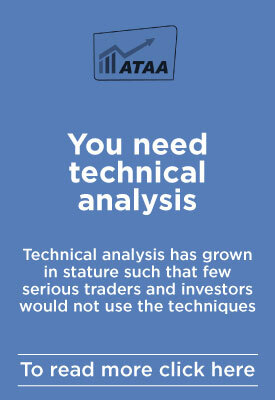 The ATAA aims to perform an educational role by promoting the theory and practice of technical analysis and to assist its members in becoming more knowledgeable and competent technical analysts. In furthering its aims the ATAA offers general material and information through its website and publications therein. The material provided on this website has been compiled for your convenience and made available for general personal use only. ATAA makes no warranties implied or expressly, as to the accuracy or completeness of any information contained on the ATAA website. The material has been provided for the purpose of education and does not constitute financial product advice. 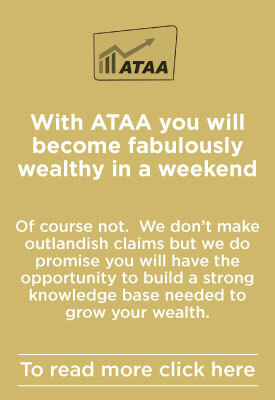 The ATAA makes no recommendations to invest in any financial product nor to use any particular methods of investing. It is strongly recommended that you seek independent professional advice before making any financial decision or proceeding with any investment. The ATAA directors, affiliates, officers, employees, agents, contractors, successors and assigns, will not accept any liability for any loss, damage or other injury resulting from use of the information nor accept liability for any errors or omissions on the ATAA website. The material may include views and statements of third parties, which do not necessarily reflect the views ofthe ATAA. Information on this website is maintained by the people and organisation to which it relates. The ATAA has taken all care to ensure that the material contained on this website is based on information from sources that are considered reliable. However, ATAA takes no responsibility for the relevance and accuracy of this information. Before relying or acting on the material, users should independently verify its accuracy, currency, completeness and relevance for their purposes. 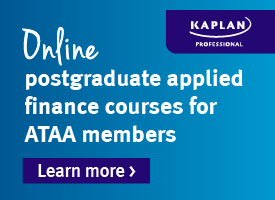 The ATAA website may contain links to other websites.These are inserted merely as a convenience and the presence of these links does not constitute an endorsement of the material at those sites, or any associated organisations, products or services.